ABR's full Dogboy: Den of Thieves audiobook review and many others can be found at Audiobook Reviewer. I’ve been thinking about this story a lot. 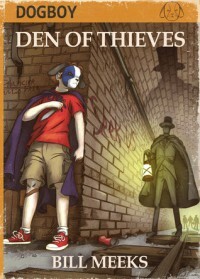 On the one hand Dogboy: Den of Thieves Book 1 was well written and narrated though admittedly the narration was simplistic, but then again, I believe it was written for a younger audience (approximately 8-15 year olds) and they would find it to be just right for them. I also believe the production of this program was well done. I’m sure my boys would love to listen to The Dogboy Adventures and then use magic tricks to become the new superheros of the neighborhood. Truly, this story could inspire a great deal of fun for family and friends….hmmm, I’m going to have to figure out costumes now. On the other hand audiobooks bring the written word to life and this story had a few very dark scenes that might upset young children, i.e., 13 year old Bronson Black’s parents are killed and he must go to live with his very evil uncle Randolph who cares not a bit for him. Yes, I know this happens in real life but the issue is worth mentioning because the things that happen to Bronson would be frightening. If a parent of the very young listens with them then the point is likely moot. With that being said, overall it’s a sometimes serious, sometimes humorous story about a boy who takes up magic after the death of his parents and uses the magic to become “Dogboy” and save his community. There are quite a few twists along the way but this young superhero is able to work through them while uncovering the mystery of his magician father. I cried a little, I laughed a little, but most of all I did enjoy listening to this first book of I imagine many more to come. Bill Meeks has a good start on this new series and narrator Nathan Beatty does a fine job of bringing Dogboy’s adventures to life. I think the artwork for the cover shows the artist to be very talented and understanding of the story, and I like it.